Brian and Scott and I have been wanting to start visiting the many establishments in the greater Seattle area who advocate beer and broaden the horizons of the "nominal" beer drinker. First up on our list is the German-style pub Feierabend. From the same owners who brought you such quality establishments as Prost! 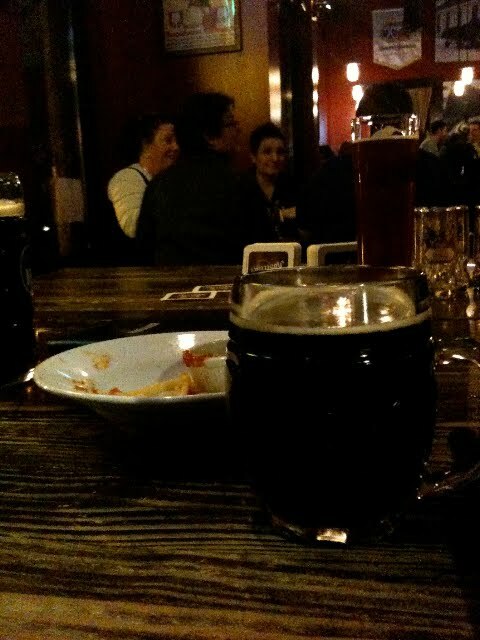 and Die Bier Stubbe, this place was almost guaranteed to be great. 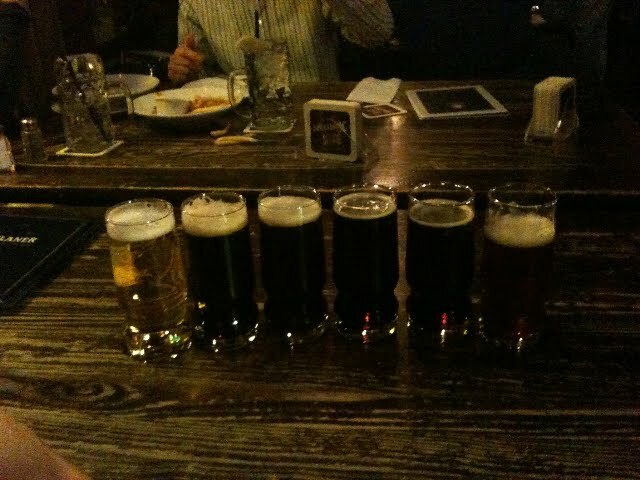 We started off with a flight of beers to warm up our palates. From left to right: Trumer Pils, Koestritzer, [some unfiltered wheat that I forget the name of], Spaten Optimator, Hacker-Pschorr Alt Munich, and Paulaner Salvator. I give all these beers very high marks (in spite of an inBev brand thrown in there ;) ). 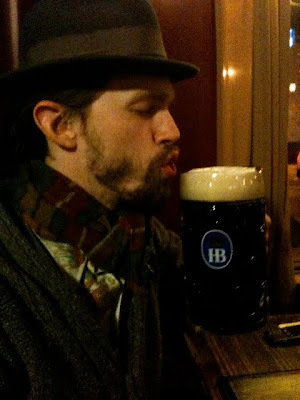 One of my favorite characteristics on dark German beers is that really distinct honeycomb or beeswax smell and flavor. 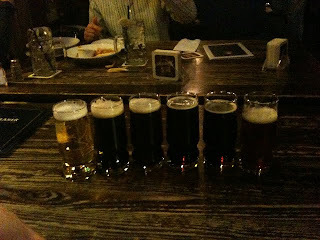 All these beers were quite pleasing to the eye, nose and stomache. I decided to follow up the flight with a Liter of Koestritzer and a weiner-schnitzel. It was heaven my readers! 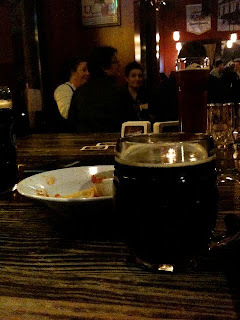 Feierabend has won it's place as my favorite German pub in Seattle (thus far). Get yourselves over to South Lake Union (just a couple blocks North of REI) and take a deep draught for us here at catholicbeer. Here are some more pics from our night there. Enjoy! 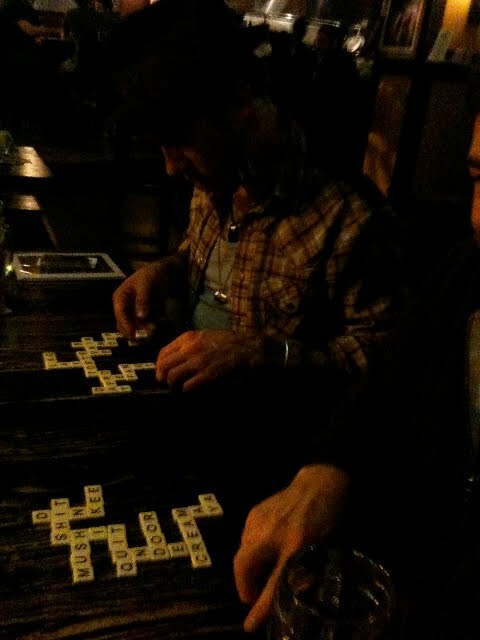 Matthew was able to join us and true to form we immediately all began playing with various puzzles which he had brought... Also 'Bananagrams' is a fun game.. unless you play with Brian. 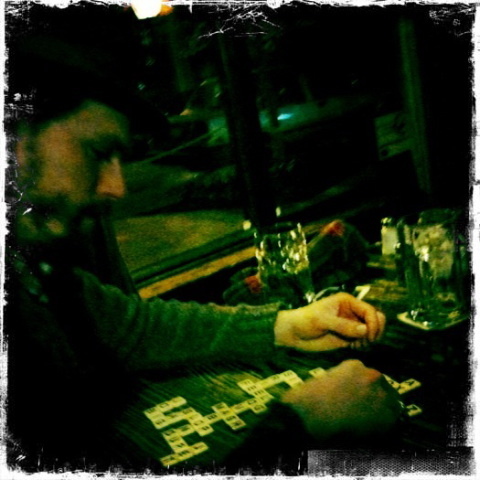 He cheats by making up the words faster than you can. 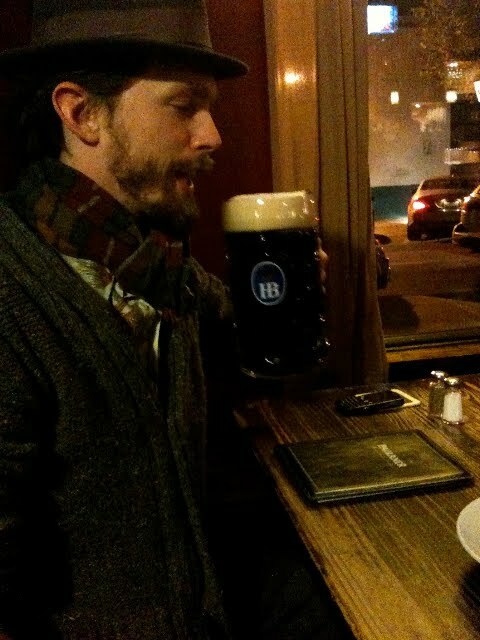 It comes in sweet, sweet Liters. All pictures from this post are courtesy of Brian's new iPhone and the $2 camera application which I bought him; Hipstamatic. Cheers all you publicans! And pour one for me.